The Bengal Tiger can be found in India as well as, Bengladesh, Bhutan and Myanmar. 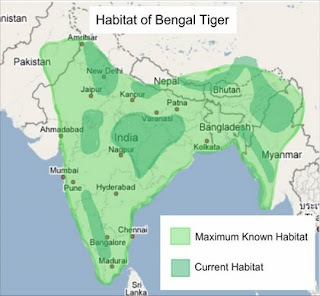 The map below shows the areas of the Indian subcontinent where Bengal Tigers can be found currntly as well as the maximum area inhabited by Bengal Tigers. Bengal tigers are often found in Mangrove forests as well as dense forest and swamplands through out the Indian subcontinent. Bengal Tigers are solitary animals, except for females with cubs. Bengal Tigers spend most of their time alone hunting in their territory. Male Bengal Tigers will occupy territories upto 20 square miles in size and the females will occupy an area upto 17 square miles. Bengal Tigers spend most of their days sleeping, hunting at night. the Bengal Tiger is a Carnivore. The Bengal Tigers prey include dear, water buffalo, wild pigs and small birds. The Tigers catch their prey by sneaking up on them and catching them in their powerful jaw. Bengal Tigers like many other predators usually look for weak or young animals that are easier to catch than larger, older and faster animals. The habitat of the Bengal Tiger has decreased greatly. Some reports claim that the Bengal Tiger population is around 4,000 Tigers compared to the 50,000 around 1900. This decreases is contributed to human expansion into the Tiger's habitat. Many farmers land was once the habitat of Bengal Tigers. 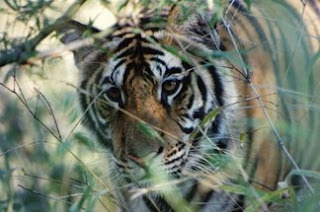 This has caused many Bengal Tigers to hunt on the farm land, this hunting often ends up with the death of the tiger. Some conservationist have suggested that tiger reserves be created to help save the Bengal Tiger from extinction and give them a place to roam that will not endanger human or tiger lives.